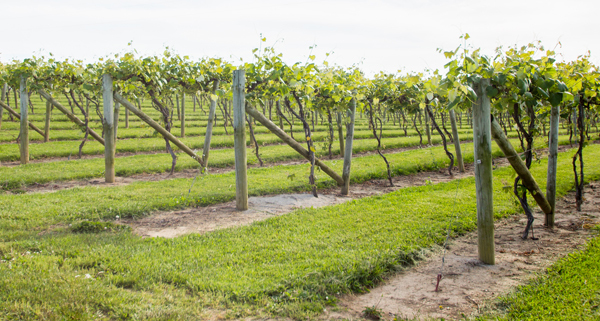 The Kentuckiana region is blessed with the natural beauty of rolling hills, peaceful waterways, and lush trees, making the area's parks one of the biggest draws for residents and visitors. In just the Metro Louisville area alone, more than 120 public parks offer visitors a wide variety of outdoor experiences. To make things even more interesting, a number of Louisville's parks were designed and created by nationally-renowned landscape architect, Frederick Law Olmstead, who is most famous for creating Central Park in New York City. Olmstead's vision for Louisville's park systems was to bring nature into neighborhoods in a way that would shape the city's geography, social interactions, and economies - a vision that is still very prominent in the city's landscape today. Outside Louisville's Metro Parks are even more options for people to play, grow, learn, and be healthy. Kentuckiana has a number of State and National parks that are a must-see for any nature lover. Some of these have a rich historic relevance while others that are simply striking with beauty. Rustic campsites, multi-purpose trails for scenic hiking and biking, well-managed wildlife habitats, and sparkling lakes for boating and water sports encourage residents to relax and explore the beauty of the great outdoors. Kentuciana’s parks offer a variety of facilities and services to ensure year-round activities and adventures. Central Park is located in the heart of Old Louisville. Nestled in the middle of the largest collection of Victorian homes in the U.S. and the summer venue for free Kentucky Shakespeare Festival performances, Central Park offers a uniqueness that can make you almost step back in time, while also serving as an ideal place to relax or play all year round. Located in east Louisville, just past Middletown, Long Run Park offers a plethora of activities from fishing and golf to horseback riding and picnicking. Kids of all ages can also enjoy the well-kept playground and sprayground that are surrounded by shaded picnic and grilling areas. Shawnee Park is another Frederick Law Olmstead design that is perfect for picnics, sports, parades, and large public gatherings. The park includes a popular golf course, a state-of-the-art outdoor athletic complex and more. Louisville's RiverWalk Trail passes through Shawnee Park and extends across the city's waterfront. This nearly 400-acre park located in the Highlands area was one of the original parks designed by Frederick Law Oldstead. The park’s main feature is the 2.4-mile Scenic Loop which offers separate lanes for vehicle traffic and recreational users. Cherokee Park offers a wide variety of amenities and activities including archery, fishing, hiking & biking, a dog run, a golf course, and much more. With over 760 acres, including a 46-acre fishing lake with a pier and boat ramp, McNeely Lake Park is one of the largest in the Louisville Metro Park system. The park also offers hiking and horseback riding trails, picnic shelters, a Korean War Memorial, and more. 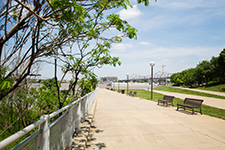 Totaling 85 acres along the Ohio River, Waterfront Park is the "front door to Kentucky" and serves as a playground for 1.5 million people of all ages every year. Frederick Law Olmsted planned Iroquois Park to be a "scenic reservation" of breathtaking views of the 10,000-year-old forest that serves as the park's focal point. 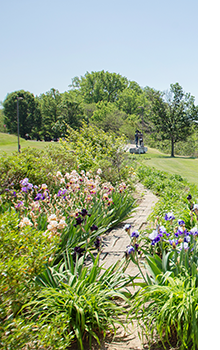 The park, located in Southern Louisville, is home to a golf course and the Iroquois Amphitheatre, which accommodates over 2,300 people. The Parklands of Floyds Fork is the city's newest park project that will include four major parks once completed. 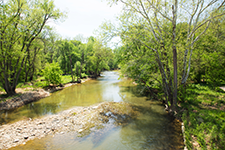 Beckley Creek Park, Pope Lick Park, Turkey Run Park, and Broad Run Park are all located in eastern and southern Louisville, along Floyds Fork Creek, and linked together by a park drive, urban trail system, and a remarkable water trail. Claimed to be one of the nation's best skate parks, Louisville Extreme Park is where skateboarders, in-line skaters, and bikers of all ages and skill levels can enjoy recreational time 24 hours a day. Centrally located in downtown Louisville, the skate park includes 40,000 square feet of outdoor skating surface with a 24-ft. full pipe, a wooden vert ramp, bowls & more. 3151 Pee Wee Reese Rd. Seneca Park was Louisville's last park designed by Frederick Law Olmstead. 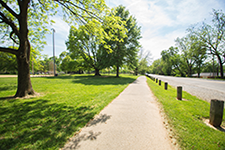 With over 530 acres in in the heart of St. Matthews, Seneca Park includes various athletic fields, a golf course, a popular 1.2-mile walking path and 3.1-mile cross-country trail, and more. 3333 State Road 60 E.